Cute 2018 Printable Monthly Calendars that are FREE! Even though we’ve got calendars on our phones and apps for literally anything you can think of, I’m a paper and pen type of gal. When it comes to staying organized, I like planners on my desk and calendars hanging on my wall! I’m super visual – so the more colorful, the more aesthetically pleasing, the more motivated I am to be on top of it all! So, in the spirit of “pretty planning”, we worked on some cute PDF calendars for you to use throughout every month of 2018! Print them out and enjoy! They are all 8.5 x 11″. If you find these free printables helpful, share it with someone else in your life! Also, let me know what other printables you’d like to see us make for you! Have a fabulous, super driven, and ultra happy 2018! Will you be doing same for 2019? There amazing love them so so much used every month! Hello Cassey, Do you do any TRX workout videos? Hope this works. Thank yuh guyzz for your efforts, appreciate it . Hope there’ll be one for 2019! Beginners in this kind of workout. New Mom that want to lose some weight. 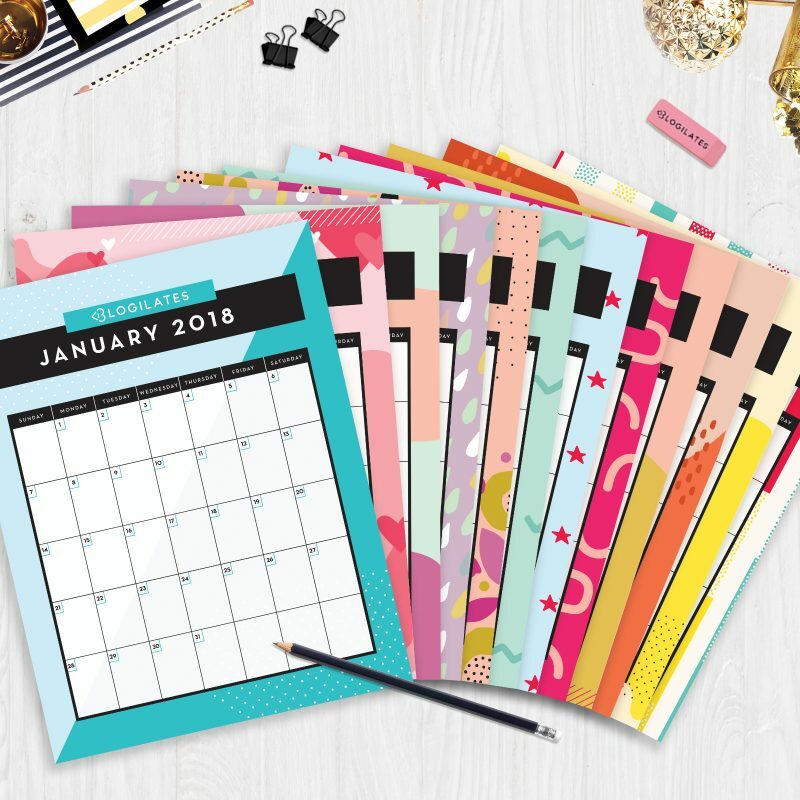 These are very beautiful and cute 2018 printable monthly calendars that are free. September 2018, I just found Cassey, after looking for a cardio easy on the knees, Wow I love your YouTube Videos!!! I’ve been sharing your vidoes with my adult children!! I LOVE ALL THE RESOURCES YOU PROVIDE FOR US TO SUCCEED! I wish some of my college professors did this LOL. THANK YOU SO MUCH <3. I've been watching your videos since like middle school and now I'm in college trying to get my fitness life together and these printables are making it so much easier. Hi. I have really enjoyed using your printable calendar. The pages are so colorful and cheerful! Thank you so much!!! Will you be sharing a printable calendar for use in 2019? Hi there 😊 you have some great items on your page! Was just wondering when the 2019 edition planner will be available. Kind regards and best wishes. I would also like to get these printables. I’d love these calendars. These are colorful and beautiful calendars to download and print. Do you have calendars for 2019 yet? I just want to say I have been following your progress since 2015 and it’s wonderful to see how your body positive fitness program has bloomed. It’s great that a lot of your beginners stuff is free so that it allows people to get started before putting out a lot of money. It also lets us save up for your cool stuff (leggings with pockets = pure genius!). Signed up, but havent recieved the fitness planner pack. Please can you send it? Thank you for cute printable calendars. can i print it ? I’ve been having trouble falling off the wagon when it comes to eating healthy, dose anyone have any advice? Thank you very much! Hi Cassey could you make another meal plan? Thanks so much for your creativity and generosity. Even if it is to build your list!! When do the 22019 calendars come out? Beautiful design Cassey! Thanks 💕. I plan on laminating mine and sticking them on the fridge. I love paper calendars. Thank you! Hi Cassey! Love you blog and videos! Love the printables as well since im also a pen and paper kind of gal ;) Thanks for the daily motivation!! Definitely need these in my life. I’d love these calendars, I’ve been struggling with body dismorphia all my life and a few weeks ago I was servierly anxious about going outside (even though in reality I looked fine) I’ve started my fitness journey and think these would really help! I would also like to get these printables. I’m already subscribed so what should I do next? Hey! I didn’t get my fitness planner packs. Can you send them again, please? Hi, Please send me the PDF please. CUTE 2018 PRINTABLE MONTHLY CALENDARS THAT ARE FREE! Hi casey I am from India and I follow your workouts. They have really helped me shed weight and look great .. thanks and now request please to send me the printable calendars which will help me maintain my weight! Thanks for sharing with us. I need to get rid of my love handles. Cassey thank you so much! You’re such an inspiration! Hi Cassey I need help in organizing my hustle. I am a Mom of 4 who loves my work, but truly needs a side hustle. I think you are an incredibly motivated hustler and I would welcome any adcice. Hey Cassey, I need your help on what to eat and what not to, to reduce the fat in my hips, thighs and also to reduce the fat in my lower belly. I’ve received your workout planner but I never received the email with the fitness planner pack. Pls help! Hi , I love your excercises , I lost punds , and I subcribe to your chanel. What a wonderful birthday present from Cassey Ho! I started your videos on YouTube a little over a month ago and love them. I am already seeing results. I did Muffin Top one today and my first thought was fun. Then later I thought not so fun but I persevered and I am glad I did. I will do it again along with your other awesome workouts. Hey, Cassey. I’m a full time student, and I find that I can’t always make time to do all of the workouts that you plan for in your monthly calendars. I really like to do them and I want to stay committed, but it takes me a while to get through them. Any suggestions or recommendations? So excited to look at the calendar! I first subscribed to blogilates emails a year or two ago, and for some reason I still have to “subscribe” every time I want to get one of the calendar printables. This was no different, so I had to re-subscribe. Only this time, I never got the email with the printables. I subscribed three different emails, thinking maybe it was a glitch, but I still never received them. It’s extremely disappointing because the Fitness Planner Pack looks beautiful and I really wanted to use them to plan my workouts. I hope Cassey and her team are able to fix this issue soon. I like the old monthly calendars better. I would always download the calendar on my phone as an image, but now when I manage to download it as an image it’s blurry. Also the workouts aren’t linked so it takes more time to find them on youtube. And I really liked the old colorful designs better. Hi Cassey, I like the new website, it is pretty. However, I am less fond of the new workout calendars.The linkable PDF one was my favorite as the most convenient for me. Also they looked pretty. To be honest, I don’t like the new one, as it is just plain and you can’t even see if it is Leg day or Ab day… Hope you will do something about the workout calendar. Hey Cassy, I really loved the old calenders- they were gorgeous and the linkable PDFs were so helpful. I can’t really see myself using this new calendar system online. They are plain, and even though it says “putting together your calendar for this month,” it is not personalized. If you plan on sticking with this new system, would you think of creating a system where we could customize on our profiles what sort of exercise we are looking for and then the calender pops out workouts that fit that idea? That way the system would really be generating “your calender.” If not, I would like the pretty, linkable PDFs back please! Will we ever get the old gorgeous and cute calendars back? That was something I always looked forward to at the end of each month… And shared with friends as soon as it came in my inbox. I hate the new, bland calendar. It’s not motivating at all. I agree with you GEE. I miss the old cute calendars. I agree. I hope we’ll get the cute and colorful calendars back. They were much better. Love using the calendars but would prefer one that I can print out as well as have it downloaded on my phone. Can you please go back to the old colanders they were more to easier to use. Because it was easier to find and to see. I can’t find the printable calendar for this month? I all was print my out. :'( :'( I was really looking forward to this month workouts. The February calendar will not load for me. I’ve been trying all morning. Me too.. it took so long to download it..
Can someone put up the February 2018 calendar somewhere actually accessible? Does anyone know where i can find the February Workout calendar, cant seem to find it. I was looking for that this morning too. I don’t think it’s printable this month- or at least when I tried it. It’s under the calendar tab and you have to register or login to view a clickable calendar for Feb that you just check off on your computer through the website. I spent a good 30min figuring that out, haha! Sorry, but where’s our February calendar?? Anyone have a clue? I have subscribed but how do i get the planner pack? Hi Alberta! Sorry for put myself into your conversation. When I started the Cassey’s workouts, I did the beginners calendar twice (cause jump to monthly ones were so hard for me), and only then I started to follow the monthly calendars..
How can I get the Fitness Planner Pack when I am already signed in?? omg, Cassey your so generous, thank you so much for keeping it free. it will help a lot with my studying. AWWW these are adorable! Thanks! I’m a paper and pen girl too and these are just perfect! Nevermind, if i click on the site link it works, maybe there’s something wrong in the newsletter link! Are you going to upgrade the blogilates app too? I follow up your monthly calendar workout everyday!! You inspiring people like me to work-out. However, I want to share with you that I am planning to become mummy shortly!!! I checked out for pregnancy workout… sadly there aren’t many… just one. Can you please post a couple of videos which I can follow-up during my pregnancy!!! Totally cute, you and your team did such a great job again!